Fresh Mushroom Europe is an important player in the world market for the full range of mushrooms. Our mushrooms are fresh without preservatives, sometimes dried, conveniently preprocessed, delicious, food safe and often unique in type and sales moment. We are a strong player thanks to our continuous focus on markets, customer desires, cost management and motivated growers. FME works hard to grow the best products, set the best price, and support our customers. Our range, concepts and packaging are aimed entirely at providing the best for our end user. This creates advantages both for retail and wholesale. We follow food trends, innovate and initiate new user moments and user options, and search and discover sales opportunities. 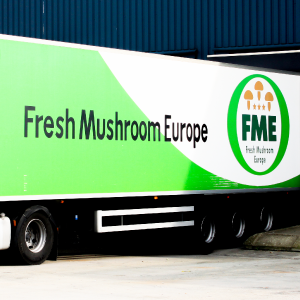 In addition to a complete range of mushrooms, FME has introduced various innovations such as stuffed white mushrooms, and portabellas stuffed with goat's cheese. Creative convenience products for various food moments, developed on the basis of mushrooms, as you have come to expect from us. We are located near Hoogstraten (Transportzone Meer, Belgium). We are centrally situated for transportation purposes. Both our small packages and bulk mushrooms follow the shortest possible route to our customer's location. Our experienced logistic network guarantees it. Mushrooms are a natural product, so that the shorter the logistic chain is, the higher the quality of the product. Time is of the essence for this product. Will you help us achieve our goal? We look forward to hearing from you.